A brilliant Bond film and excellent followup to the wildly popular Skyfall. Director Sam Mendes pulls out all the stops in MGM and Columbia’s Spectre the 24th official title in the Bond 007 franchise. After the soaring success of the previous chapter in the Bond anthology, who would have known that this final appearance of Daniel Craig as the heartthrob MI6 “paid assassin” would be just as thrilling! Just the opening sequence of the movie will have you on the edge of your seat, and the many throwbacks to past Bond film plots or characters will capture your attention for the two and a half-hour runtime. Even Blofeld, the original Bond villain, and his fluffy white cat appear in this epic Bond story. The jaw-dropping action will satisfy even the most ardent and long-time James Bond fans. Whether you’re an old-school or new 007 fan, you are definitely in for a treat. Some of the most refreshing and getting-back-to-authentic Bond elements, of the Craig chapters in the series, is the lack of over-the-top and at times absurd gadgetry, and a return to the very essence of what makes this franchise stand the test of time. After the tragic events at Skyfall and the destruction of MI6’s massive facility on the Thames, James Bond 007 (Craig) is following a lead in Mexico City thanks to a cryptic posthumous message from the former Agent M (Judi Dench). When the actions in Mexico City draw the attention of the UK’s new head of security and Agent M (Ralph Fiennes), 007 is both grounded and puts the very existence of MI6 in jeopardy. After an unauthorized mission to northern Africa, 007 learns of the sinister crime syndicate known as SPECTRE. Coming face-to-face with the leader of Spectre, 007 learns of a chilling connection between the leader and himself. From northern Africa to the Austrian Alps, 007 must race against the clock to stop a big surveillance data collection organization from being the eyes of the world, and take out the leader of Spectre before he has his hands in the security pockets of several countries around the world. This final chapter in the Craig Bond series has it all: action, romance, espionage, intrigue, and car chases. But probably the best elements of the movie are connected to getting back to the very core of what has kept this franchise alive for over 50 years and 24 official titles. Despite the success and popularity of the 90s Brosnan 007 movies, they tended to place a lot of significance on the futuristic and ultimately impossible gadgets. Understandable, because the 90s were a time of massive personal electronic device innovation and the dot com boom. However, this emphasis on the gadgets took away from the plot and character development. Still, those era of Bond movies were exciting and still popular today amongst mostly the newer Bond fans. Returning to the very essence of what make Bond the 007 that fans adore is what makes the Craig films unique and exciting–especially in Skyfall and Spectre where 007 truly comes into his own. We still get some gadgets and the famous Bond film cars, but there is a degree of believability and realism that exists in these films that did not exist in the 90s Bonds. Even though these are still high concept films that have over-the-top action packed sequences, these movies still have a sense of old-school espionage class about them. An interesting side note: there is definitely a hint of the plot from Tomorrow Never Dies in this current installment. No 007 movie would be complete without an original song that is eerie, romantic, and mysterious all at the same time. The title song from Skyfall performed by the incomparable Adele was an outstanding work of music and lyrics. It truly embodied the film itself and cemented her career as a master of soul/jazz. I cannot say the same for Sam Smith’s performance of “The Writing’s on the Wall.” I was not all that impressed with his performance and I thought the song itself paled in comparison to 2012’s “Skyfall.” Despite the fact that I didn’t personally care for Sam Smith performance or the song, it definitely still had that Bond theme flare about it. Between the graphics and editing, you still knew that you were watching a 007 movie without needing to see the poster or title. Looking to the next vocal artist, I’d like to see Elle King perform the next Bond theme song after her very Bond-ish sounding “Under the Influence.” Regarding the film score, Thomas Newman shines as he so often does with his remarkable talent for capturing the soul of a film in the score that accompanies it. Facing the popularity of Skyfall, it was definitely a monumental task for Mendes to direct this Bond film. And although I do not feel that Spectre is better than Skyfall and at times I felt that I enjoyed the previous one more, I still thoroughly enjoyed this present installment of the anthology. And to my pleasant surprise, Dame Judi Dench makes a small cameo appearance as the M we’ve had for nearly 20 years. In respect to the characters in and of themselves and their personal/interpersonal relationships with one another, I really felt that the chemistry between M, Q, 007, Money Penny, and Blofeld was right on the ‘money.’ There really isn’t much in the way of traditional or conventional character development but that is commonplace in high-concept films. However, the glimmer of development in both M and 007 was enough to show that these characters and actors were almost made for each other. It was never awkward or boring to watch their interactions with one another. Ready for an actual spy movie filled with assassins, intrigue, espionage and romance–especially after having sat through Bridge of Spies??? 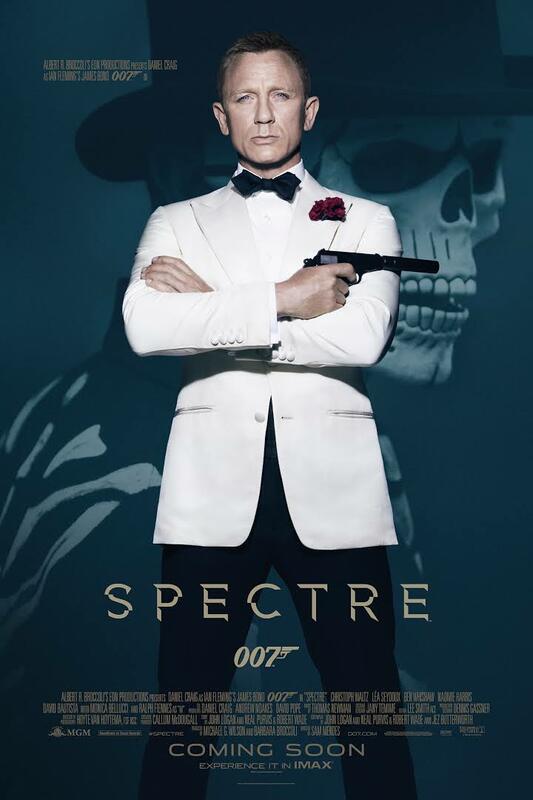 Then definitely watch the next chapter in the Bond, James Bond 007 anthology SPECTRE! Prepare yourself for over two hours of excitement, explosions, and dynamic car chases. Return to old school Bond! Watch as many plot elements through the years and even the villain who started it all make it full-circle. It seems we do disagree on SPECTRE! For me it was a soulless enterprise, but maybe all of the 5 star reviews in the media made me overly critical! Great take on the movie, I fully enjoyed it.